We are approved agents for sales and application of Bioway in Cape Town. The increasing infestation and spreading of “BITING” crawling and flying insects is of major concern in all households, because of their causing allergies, hayfever and sinus problems. In the tourism and accommodation providing businesses, guests luggage and clothing serve as ideal hosts for spreading these insects to other areas. Thousands of personnel and guests experience the unpleasant consequences of insect-bites, irritation, frustration, and the inconvenience it causes them. Uncontrolled insects are mostly associated with unhygienic circumstances, poor and irresponsible management or inferior accommodation facilities. Bioway multi insect and dustmite killer provides effective, clean, easy and safe insect control for households, accommodation providers and other properties, contributing to pleasant and enjoyable living conditions. Because of their nervous tracts and systems, insects easily come into contact with Pyrethroid substances. The Permethrin and Bioallethrin molecules are quickly absorbed by them, it penetrates their nervous system, causing certain death. 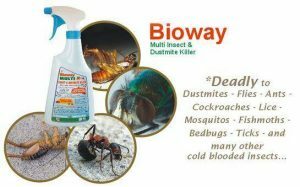 Bioway kills dustmites, flies, ants, cockroaches, lice, mosquitos, fishmoths, bedbugs, ticks, fleas and any other cold blooded insects, including their larvae and eggs. The neurotoxicity caused by this product in insects interferes with their host seeking and biting behaviour at very low concentrations. Clean, easy to use, hygienic and effective insect control. Odourless, does not mess or stain. No synthetic solvents. No annoying, unpleasant or harmful gasses. Immediately safe. No need to vacate sprayed room or area. Excellent use for all households, hotels, resorts, guest houses, lodges, chalets, tents, etc. Ideal for camping, braaing and picnics. Not harmful to humans, mammals or birds, once product has dried. Ideal for spraying suitcases, hand-bags or luggage while travelling, camping or hiking. For more information and pricing, Contact us Here.